Listen to "Cursed" on your iOS and Android device. Whomsoever draws the sword from the ancient seat of this land shall rule her, and they shall bring peace and prosperity to her people. For nearly a thousand years, the firstborn son of every Cannamore king has drawn the sword, and the land and her people have indeed prospered. Princess Nyx Bel-Hannon is neither male nor firstborn, but it's her hand that draws the sword rather than her twin brother's. Her reward: imprisonment. But a deep darkness now spreads across the kingdom, and her borders are threatened by creatures capable of magic powerful enough to destroy mountains and split the land asunder. Without the true heir to wield the sword, Cannamore risks annihilation. The king and crown prince want nothing more than to be permanently rid of Nyx, but cannot afford her blood on their hands. Instead, they give her to a fractious warlord in the hope he will do what they dare not. Nyx has no intention of letting the warlord get in the way of her thirst for revenge or the need to claim her throne. 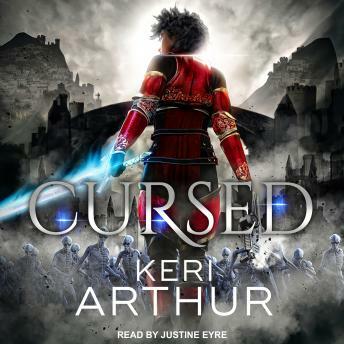 But it's a quest that may well destroy the kingdom she loves, because Nyx has been cursed by the god of war. It is her destiny to save Cannamore.